Everyday cleansing can be harsh on skin. Simple Kind to Skin Cleansing Facial Wipes are merciless on makeup yet softer than silk, designed for sensitive skin. 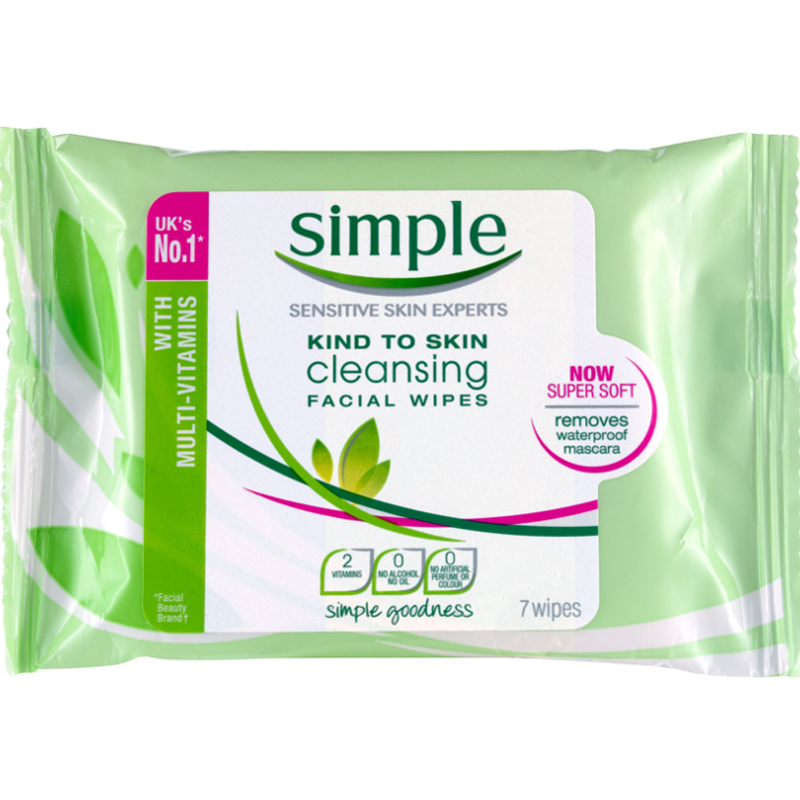 The improved cleansing facial wipes are made of softer than silk fibres, gentle cleansers, purified water and skin-loving ingredients such as vitamin B5 and vitamin E. It lifts away dirt, grease, impurities and removes makeup effectively, even waterproof mascara, while instantly hydrating your skin. • Does not dry out, irritate skin, or leave residue. Skin is left feeling thoroughly clean, fresh and hydrated. 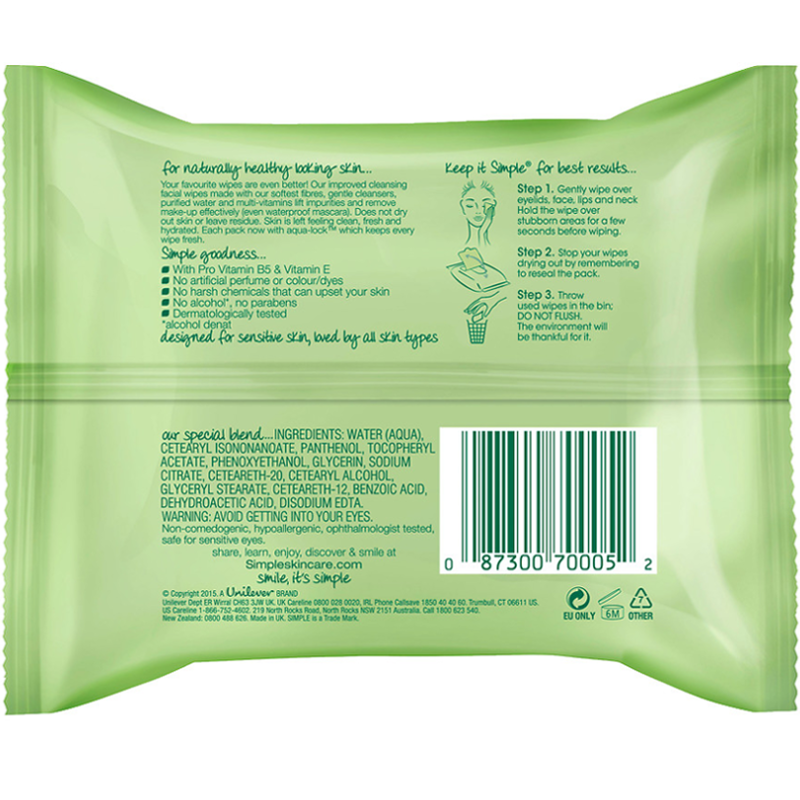 • The new improved packaging incorporates the aqua-lock™ which helps prevent the cleansing facial wipes from drying out so every wipe stays as fresh and effective as the first. • Convenient and quick-to-use, these face wipes are an indispensable addition to any makeup bag, gym kit and bathroom to give a gentle cleanse or touchup for naturally healthy-looking skin every day, wherever you are. 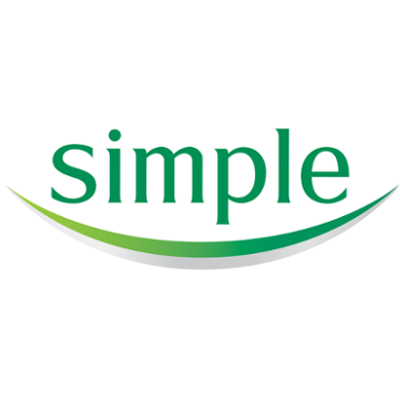 • As with all Simple® products, there are no artificial dyes, no alcohol, no harsh chemicals and no perfume that can upset your skin, perfect for even sensitive skin. Gently wipe over eyelids, face, lips and neck. Hold the wipe over stubborn areas for a few seconds before wiping. Suitable for use around the sensitive eye area. Do not flush. The environment will be thankful for it. I love these soft wipes which are gentle on the skin and very efficient at removing all make-up. Nice to use, but a bit expensive. Very gentle on your skin. Packaging like on other wipes is a bit of an issue with the plastic cover losing its stickiness after a while. 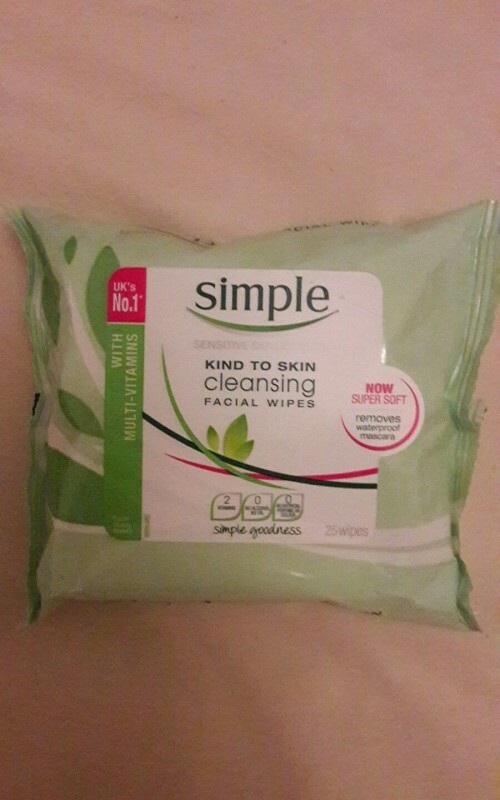 These wipes work at cleaning the skin and removing make up, skin feels clean and moisturised but not greasy, they are easily available and very easy to use, a convenient product if you don't have much time, if you are travelling or if you are not so disciplined about taking your make up of at night. The problem I have with these wipes is that they are on the expensive side, I've tried lots of different wipes, some much, much worse, some not so good, but some that are equally as good as these and yet have been one or two pounds less. I would recommend trying the discount stores to try and pick these up or trying Boots own brand, even Asda's wipes are very good for just £1 a pack. I would buy these if I had more sensitive skin, just to see if they were better for me, but as it is, I think I will stick with something a little less expensive for now, but I would like to use these on a regular basis if the price came down a notch. These are the best makeup wipes I have use. They are very gentle and are really effective at removing makeup. I always use these before using my Clarisonic Mia 2 to get rid of all the makeup and oil thoroughly. I like to store the makeup wipes upside down so that the liquid can fall down onto the top wipe rather than them being really dry and the bottom ones really damp! I can't really say anything, apart from they do tend to become expensive if you have to keep repurchasing but you can often find them on offer. I was not a regular user of facial wipes before. However, I was lucky to try these for free and love the convenience of the wipes. One wipe rather than 3 cotton pads and products ! The wipes fee really soft. They have a textured and a smooth side which makes it great to use on face/eyes. My skin feels clean and refreshed after using them. I love the fact it contains no alcohol or oil. Even better, there are no artificial perfume. These are all the plus sides. On the minus side, the pack says it is effective, even on water-proof mascara. Unfortunately, I did not find it all that effective on normal mascara, let alone on strong water-proof. And although my skin feels very refreshed, it takes a while to dry out. Do not try to remove the day make-up and immediately apply the evening one immediately. Am I a convert ? Absolutely yes to take away on week-ends and holidays. They work well enough and are much easier to pack. Would I use it every day at home ? I think I will stick to my eye-make up remover and pads for now. No alcohol, artificial perfume or oil. Not effective on waterproof mascara. My fiance brought me this in a gift pack for Christmas. They are very effective and gentle to my skin which is very senstive. I like them very much. But I do have one problem. The sticker over the hole, wish it would stick down and stay there. Maybe if they did some sort of box for the wipes it would be a good idea.